A healthy lifestyle can sometimes deprive you of your favorite comfort foods (especially if you're training for a pageant), so instead of binging on unhealthy bloating fatty foods, I tried out the healthy version of pizza: Quinoa Pizza Bites! I found this recipe on Pintrest but decided to make it even more healthy! You won't feel an ounce of guilt snacking on these, but it sure will satisfy that "comfort-food" craving! This batch made 2 snack servings for me. If you want a lot of leftovers (or have multiple people eating them- they go quick), then double this recipe! You can also toss in 1/4 c. diced cherry tomatoes, mini pepperoni slices (unhealthy but yummy), diced peppers... get creative! 1. Cook your protein-filled quinoa! Boil the quinoa and 1c. water and cover. 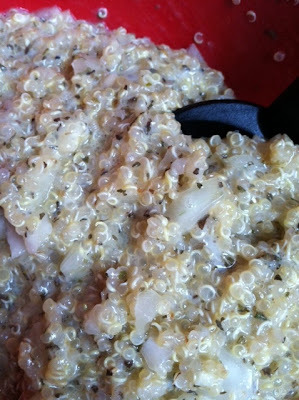 Once boiling, reduce heat to low, and let it simmer for 15-20 minutes (until water is absorbed and quinoa is tender). 2. Preheat oven to 350 degrees. Combine all of your ingredients (except the pizza sauce) in a mixing bowl until it is well mixed. 3. 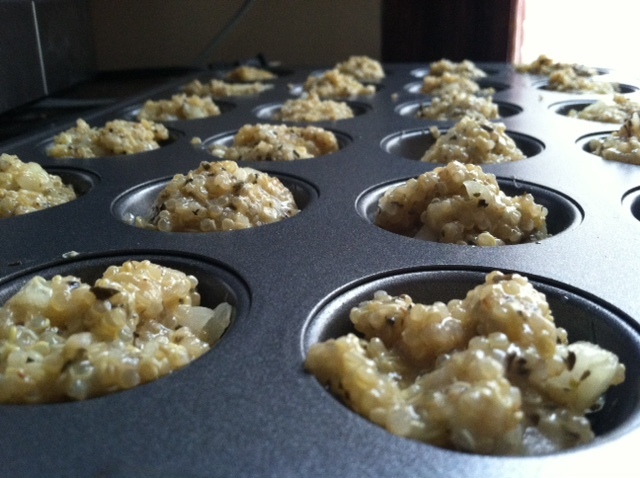 Lightly spray the bottom of a mini-muffin tin with olive oil spray. Using a Tablespoon, scoop ~1T. into each muffin tin, it should fill almost all of them! 4. Bake them for 15-20 and let cool. Serve them warm with pizza sauce to dip in! Making this right now!! So excited to try it. I have Crohn's disease and am gluten I tolerant so good recipes are slim pickings. Thanks for sharing! You will love them! Let me know how they turn out! My readers so far have had success :) Thanks for reading! Thanks for the recipe! They are soo good! I've found I like to make a couple of batches so I have them when I don't have time to prepare dinner. Do you know if you can leave these out in a ziplock bag or if they should be refrigerated? They have both egg, and cheese- both perishable ingredients. Refrigerate. Made this for dinner! I used a pre seasoned Mediterranean quinoa and it still turned out super yummy. Also used a standard sized muffin tin since that's what I had. Next time I think I will add a little crumbled sausage in this. soooooo good. These look amazing. I am going to make some right now to give the kids for lunch. I have been trying to get them to eat quinoa and they just have been refusing to try it. But pizza bites? How can they refuse pizza bites? Thanks so much! Success! My 7yr old gobbled them up! He can't wait for me to make them again. My 3yr old, not so much, but she is the pickiest eater I have ever met. I quadrupled the batch and I am freezing the extras to pull out for future lunches and snacks. Thank you so much!!! I will be making these tomorrow..I love that the ingredients are easy and they seem so easy to make.. These look so good! I am going to try them today! 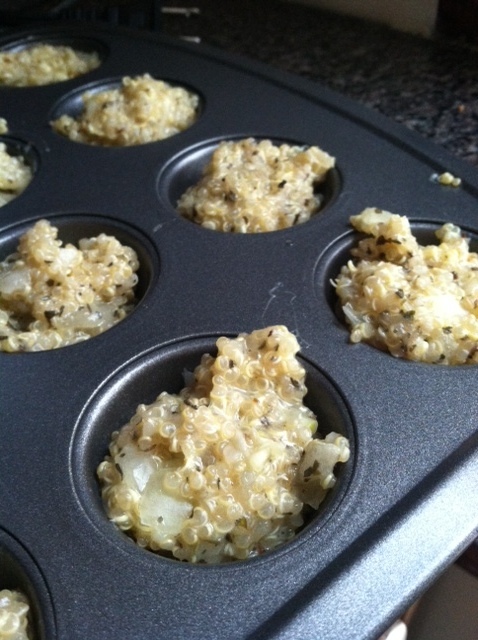 These are in my oven right now, first time using quinoa and I am so excited to try them. Thank you for sharing! If I freeze these, what would be the best way to re-heat them? I would love to try this now but i would like to make sure the cheese is included into the Quinoa mixture to bake as well? Ladies not laugh at me (embarrassed lol in a humble way. I am not in the kitchen too often. But this recipe can change things. I just found dinner for tomorrow night! Thank you so much for sharing this. Can't wait to try these! I just started cooking with quinoa and made meatballs (using ground chicken) with it last night. Have you tried turkey pepperoni? I like it more than the standard stuff. are you able to make this recipe with egg whites instead of a whole egg? Thanks so much for posting this protein filled recipe! I'm a vegetarian always on the hunt for simple fun healthy recipes. I found this post on pinterest. Do you happen to know the amount of fiber per serving ? Really? 265 calories? My quinoa box says 172 calories per 1/4 cup? yes, but you have to account for the other ingredients in figuring out the calories too, particularly the cheese! I made these and my kids LOVED them! Definitely a recipe I will use again soon! What can i replace the eg with to make it vegan? I always replace eggs with 1T ground flax seed & 2T of water. Let it set for 5 minutes or so & it has the same consistency as an egg. It works perfectly! While I am most definitely NOT training for a pageant, I will give this recipe a shot. I'm always looking for high protein snacks after having gastric bypass last year. The ones made by places like Bariatric Advantage, etc. are just plain nasty. This is yummy! These are in the oven right now! I had pizza seasoning from Penzey's so I used that and a dash of herbs de provence. Then I added a little sprinkle of thyme in the quinoa water. I can't wait to try them! They tasted good, but were def not finger foods. We had to use spoons because they fell apart. They were still really good though! I modified this into a "pizza crust" by spreading the mixture into a small saute pan and cooking on med-high about 3 minutes or so on each side (until each side was brown and crispy). Then I spread a little Light Prego and extra shredded cheese and popped under the boiler for a minute. GREAT alternative for a single serve pizza!!! Is the Quinoa really suppose to be uncooked? This doesn't look right. Courtney, the first instruction is to cook the quinoa. :) Making them tonight. These are awesome! BUT, they completely fell apart when trying to pick them up and when dipping them. Any suggestions to get them to stick together so they can be dipped without crumbling???? I cooked mine much longer than suggested-If you leave them in for closer to 30-40 mins they stay together much better and are not over cooked! I thought the same thing. would be curious to find the answer. You got it!! It makes two servings. Meaning that 12 bites is 265 calories. Even calculated it all out :) ENJOY! If you don't have a mini muffin tin could you just roll them up and bake them on a cookie sheet? These are incredible! Great recipe! Oops! I was so confused when didn't fill all 24 muffin holes ( made 20) and when I added in the calories myself each bite was only 16 calories each and the whole thing was only 322 calories. So I looked back over and realized you put 1/2 cup uncooked which makes a lot more than just 1/2 a cup which is all i used! I also used egg whites but wow. I only ate twelve but hahah I could have eaten them all! I'll be blogging about them soon! Thank you! Made these vegan with Daiya mozza shreds and egg replacer. I didn't have a mini muffin tin so used a regular one. I'm not sure if it was the modifications or the size of the bites but they didn't stay together. That being said, this concoction is SO YUMMY! I'm thinking next time i'll chuck it in a loaf pan with some extra veg (peppers, zucchini, etc) and eat it like a casserole. YUM! Mine didn't stay together either, and I used a mini muffin pan. I think next time I'll add some additional egg to help them stay together. I think this was part of my problem. I also had to add a little extra water to the quinoa when I cooked it, but it didn't quite become the soft texture I needed. This plus the lack of egg may have been the culprit. :) Thank you Thank you!!!! Thank you for such a great blog! My focus is also on health. Is there a way to print out a simple version of the recipes. That would be such a great feature! Making my second batch because my husband loved them! This time I'm adding finely chopped zucchini. This recipe is a winner! Yep - this is DEFINITELY on my "to-make" list! I just made these, and I hate to be the odd man out, but I thought they were rather bland. I didn't spray tin with olive oil (forgot) and added a few slices of turkey pepperoni. This was my first experience with quinoa. I'll try again with grape tomatoes and green pepper. Just reheated with a sprinkle of season salt, dab of pizza sauce, slice of turkey pepperoni, and sprinkle of ff mozzarella... those were yummy. Adds a few calories, but not many. 350 for 10 min, then added cheese and popped in a couple more minutes until melted. I tried these last week and wanted to eat them ALL! LOL! I'll be turning it into pizza crust tonight for my gluten free friend who is always left out of the "fun food". GREEK - feta, oregano, sun dried tomatoes. Dip in Tzatziki sauce. TX BBQ - plenty of onions and garlic, turkey bacon or turkey sausage (for smoke). Dip in BBQ sauce. ASIAN - ginger, garlic and scallions. Dip in sweet Thai chili sauce or peanut sauce. Love your site, your recipes and the great suggestions from others. Is there a way to print a condensed version of the recipe? I just made these and they are SERIOUSLY delicious! We are a household that LOVES us some pizza, and these are a very tasty variation! Yum! The only thing I did differently was to make a "flax egg" instead of using an actual egg. Worked great! I would consider 235 calories a meal not a snack. Eating these as we speak, and they're so good! Only just discovered your blog, and already want to thank you for it, as I know it is going to contribute greatly to the journey I have just begun towards an even healthier lifestyle than I already live! Looks yummy. Hard to read the orange writing on the orange background. I had to copy and paste it into a word doc. i just finished eating them!!! AMAZING!!! I added to the recipe cherry tomatoes and a few black olives, then baked it in a small tray. When it was ready i added the tomato sauce and baked for a couple of minutes more. Absolutely delicious!!! This was my first time ever cooking with quinoa and it turned out amazing! Hi Morgan! 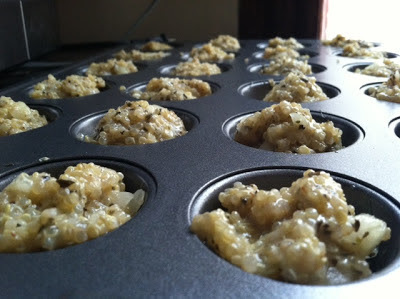 I'm so glad you adjusted my Quinoa Pizza Bites recipe to make it healthier and fit your tastes! Yours look great! Would you mind just adding a link to the original recipe somewhere in your post? I'd really appreciate it! Thanks! These are delicious! 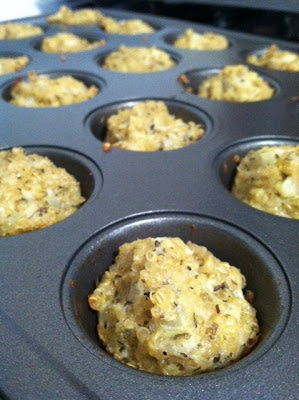 I just made them and they turned out great, even using a regular sized muffin tray. I could definitely see myself making these a lot and changing up the recipe a little each time! Thanks! I added marinated artichoke hearts (drained), less cheese, diced tomatoes, pesto, and didn't measure out the seasonings...just eyeballed which I always do. Used garlic powder and then topped each one with a little Parmesan. Doubled the recipe so used 2 eggs. They were sorta bland. If I make again I will kick the seasonings WAY up. Also, they fell apart. only 2 of the 5 I just ate retained their shape and they were definitely NOT dippable. I ate with a fork and basically ended up eating a bowl of quinoa with a bunch of stuff in it. Now, they were definitely filling and not horrible to eat, they just need to be way jazzed up and I need to figure out how to get them to hold together! I am telling you about mesothelioma cancer. The infection reaches up to two layers of the pleura. The function of the pleura is to produce lubricating fluid that aids the normal working of the lungs. Excess fluid is absorbed in bloodstream and removed from the body to maintain balance. Due to infection in the pleura in this stage, this process is disrupted, which leads to congestion in the pleura. The increase in the level of fluid causes discomfort in the chest and problems in breathing. In many cases, patients experience persistent, dry coughing. Appropriate diagnosis of the congestion is achieved through X-ray examination. Up to this stage, Mesothelioma Cancer can be surgically treated through the Mesothelioma Brighan System. Thanks for the shout out on the quinoa pizza crust. Hey I my friends I tell you something can you give me answer please. Allergy injections do not get rid of your allergy to a substance-they raise your threshold, so that you can tolerate more of the substance before you experience allergy symptoms. But a virus has almost the same effect, temporarily. It is not unusual to see allergic skin lotion clear or respiratory symptoms disappear during a virus attack. Surgery or other major trauma, such as breaking a bone, almost invariably shuts down allergy symptoms as well. I tweaked the recipe a bit due to allergies. I used egg white, cut the cheese in half added shredded zucchini and some chopped up already cooked eggplant. They were delicious. I love these! I had sliced provolone cheese so I put it on top before I baked it instead of mixing it in and it helped hold things together and gave it a real pizza feel with cheese on top. I also used some quinoa I had made earlier in the week that I had put shredded zucchini in it already but it turned out great! Thanks! I loved this! My husband is a big meat eater and a fan of the unhealthy snack (aren't we all? ), and he liked them as well. Thanks! I believe the evidence as a whole shows that chronic consumption of foods with an excessive reward value causes abnormalities in parts of the brain that regulate body fatness, metabolism and reward/motivation. 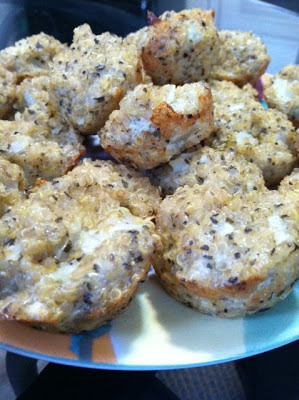 Thank you for this recipe...my friend and I have different health/dietary concerns (she has celiac disease and I am an ova-lacto vegetarian) and this recipe is accessible and enjoyable for both of us to enjoy together. healthy lifestyle can lead to a significantly longer life.All the contents you provide in post is too informative and useful. I calculated the points for Weight Watchers Points Plus. 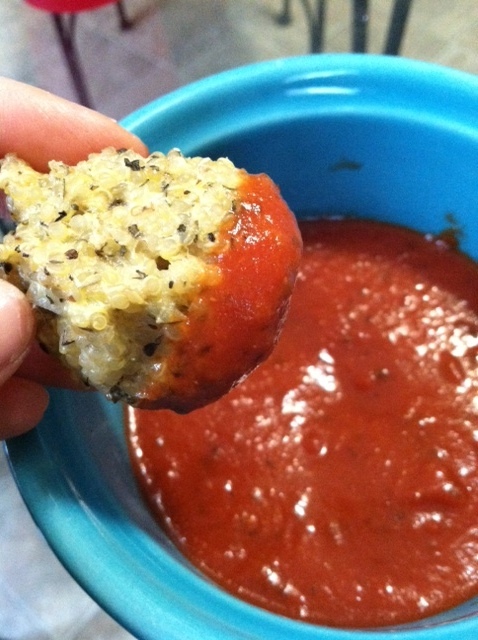 Looks like 6 quinoa bites with 1/8 cup of pizza sauce = 4 points (assuming a full recipe makes 24 bites.) Could be a nice snack or light meal. Thank you so much! I was just trying to figure this out!! This is probably a stupid question, but does the type of quinoa you use effect the taste? I have red quinoa that I got on sale... is that ok to use for this recipe? Thanks! Great recipe! My 1 year old and 3 year old gobbled these up. They kind of fell apart though....I think because we didn't let them sit in the muffin tins long enough when done, because the kids were so hungry. Really very super blog and very outstanding information about the taste of all the foods and chines foods. Thanks for the post. I am very glad after ready and get useful information about the restaurants from your blog. Ex client work and absolutely very nice information about the Village food factory it's good work. I have been reading your posts regularly which is specially for clean eating lunch .I need to say that you are doing a fantastic work. Please keep it up the great work. Health and skin care is very are very important for life and that's why some medicine and some tips are specially design for health and body care. Such a nice blog and very nice you work and sharing this wonderful article about the patients nice work. Can someone suggest a good Restaurant in Delhi ? (in average Budget).? Wow!nice article and containing allot of information about the fitness and exercise well done. Your Post is very useful, I am truly to this blog which is specially design about the body care,healht,best Bright Horizon Health, It helped me with ocean of awareness so I really appreciate your blog. Is a woman cooking and cleaning for her husband and kids an outdated expression of love? Such a nice blog and very nice you work and sharing this wonderful article about the health. I like your blog it's really cool and nice thank you for sharing this great information about the chicago style food well done. Your blog have allot of detail about the seo for surgeons it's good job. Why do Americans despise the idea of free healthcare? It's really very nice and important blog about the health and fitness that i appreciate it well done.